The Neumann geodetic boundary value problem (NGBVP) represents an exterior oblique derivative problem for the Laplace equation. The Neumann boundary conditions in the form of surface gravity disturbances correspond to derivatives of the unknown disturbing potential. The boundary element method (BEM) as a numerical method based on the variational formulation of the Laplace equation is applied to NGBVP. This approach gives a variational (approximate) solution directly on the Earth’s surface, where the classical solution could be hardly found. This paper discusses the 3D BEM application to NGBVP. It represents a new approach to the global quasigeoid modelling. The collocation technique with linear basis functions is applied for deriving the linear system from the boundary integral equations. With respect to a giant size of the Earth and in order to get accuracy as high as possible, computing on high-speed parallel computers is necessary. The Global Quasigeoid Models as the numerical results for two input data sets are compared with the geopotential model EGM-96. The fixed gravimetric boundary-value problem (FGBVP) represents an exterior oblique derivative problem for the Laplace equation. Terrestrial gravimetric measurements located by precise satellite positioning yield oblique derivative boundary conditions in the form of surface gravity disturbances. In this paper, we discuss the boundary element method (BEM) applied to the linearized FGBVP. In spite of previous BEM approaches in geodesy, we use the so-called direct BEM formulation, where aweak formulation is derived through the method of weighted residuals. The collocation technique with linear basis functions is applied for deriving the linear system of equations from the arising boundary integral equations. The nonstationary iterative biconjugate gradient stabilized method is used to solve the large-scale linear system of equations. The standardMPI (message passing interface) subroutines are implemented in order to perform parallel computations. The proposed approach gives a numerical solution at collocation points directly on the Earth’s surface (on a fixed boundary). Numerical experiments deal with (i) global gravity field modelling using synthetic data (surface gravity disturbances generated from a global geopotential model (GGM)) (ii) local gravity field modelling in Slovakia using observed gravity data. In order to extend computations, the memory requirements are reduced using elimination of the far-zone effects by incorporating GGM or a coarse global numerical solution obtained by BEM. Statistical characteristics of residuals between numerical solutions andGGMconfirm the reliability of the approach and indicate accuracy of numerical solutions for the global models. A local refinement in Slovakia results in a local (national) quasigeoid model, which when compared with GPS-levelling data, does not make a large improvement on existing remove-restore-based models. The paper presents a high-resolution global gravity field modelling by the boundary element method (BEM). A direct BEM formulation for the Laplace equation is applied to get a numerical solution of the linearized fixed gravimetric boundary-value problem. The numerical scheme uses the collocation method with linear basis functions. It involves a discretization of the complicated Earth’s surface, which is considered as a fixed boundary. Here 3D positions of collocation points are simulated from the DNSC08 mean sea surface at oceans and from the SRTM30PLUS_V5.0 global topography model added to EGM96 on lands. High-performance computations together with an elimination of the far zones’ interactions allow a very refined integration over the all Earth’s surface with a resolution up to 0.1 deg. Inaccuracy of the approximate coarse solutions used for the elimination of the far zones’ interactions leads to a long-wavelength error surface included in the obtained numerical solution. This paper introduces an iterative procedure how to reduce such longwavelength error surface. 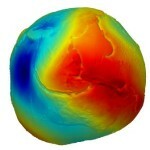 Surface gravity disturbances as oblique derivative boundary conditions are generated from the EGM2008 geopotential model. Numerical experiments demonstrate how the iterative procedure tends to the final numerical solutions that are converging to EGM2008. Finally the input surface gravity disturbances at oceans are replaced by real data obtained from the DNSC08 altimetry-derived gravity data. The ITG-GRACE03S satellite geopotential model up to degree 180 is used to eliminate far zones’ interactions. The final high-resolution global gravity field model with the resolution 0.1 deg is compared with EGM2008.